With a wish to bake and the fact that I had no bread at home I baked this simple bread. Even though it would be very easy to run down to the bakery and buy a good bread. I love french bread. If it´s from a good bakery 🙂 ! 1,5 dl yoghurt ( I had some yoghurt that started to be old, that´s why I used it 🙂 If you don´t want this, just add a little more water. As flavour I used whole seedes of fennel. Sometimes I add 1 spoon of honey if I prefer a little sweet touch. Set the owen at 250 degrees. Mix all the dry ingredients, add water and stir. Bake it in the owen! When you put the bread in the owen, lower the temperature to 200 degrees. Bake it for 50 min- 1 hour. Just mix and bake it? No fermentation time? Not with only baking soda, but if you add some yeast, yes! Around 30 min. Both works. Sounds delicious! What are you using to measure the oven? Is it 200 Celsius? That’s a hot hot oven! So I was just wondering. Thanks! You saved me from homeland nostalgia (life is not easy for a German bread lover living in France…)! 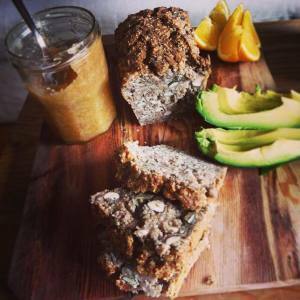 I was looking for a healthy and energy-laden alternative to French bread which at the same time reminds me of the German seeds & rye bread I love so much. I tried you recipe – adding dried dates, pistachios and some agave syrup (this one for my sweet tooth) – and it worked out so yummy! You’re a star! Thanks you so much! It will be hard to get some of the ingredient down south here in Chile (i.e. chick peas & rye flour), but it will remind me the good bread that I had some years ago in Bergen, and! it will give me more energy before and after my runs 🙂 Thanks for the recipe!